1 double bedroom, and 1 bedroom with full size bunks. Our house is ideal for a quiet family holiday, being well equipped to make your stay enjoyable, with patios front and back. 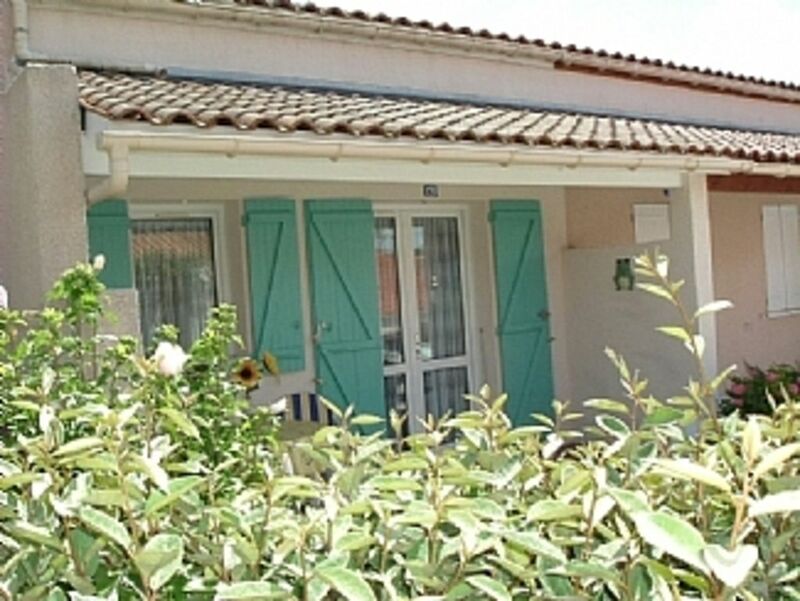 The privately owned, and gated residence consists of purpose built holiday homes, ours being one of the larger designs.The residence has its own secure swimming pool, and children's paddling pool, tennis court, boules pitches, table tennis,free wi fi on site, and is an 8 minute walk from the nearest beach, Plage Vergnes, 1 of 5 locally.There are 6 restaurants within walking distance, ranging from gourmet to a pizzeria. A short car ride away are the huge beaches of the Grand Cote and Cote Savage. Enjoy also the local specialities in the seafood restaurants at Meschers Port, the local wines and 'Pineau'. In July/August there are numerous free events for holidaymakers, such as firework displays, craft markets, musical performances and nocturnal markets. Royan, a lively seaside resort and town, is 6km away. The house is ideally situated to explore the beautiful countryside and coastal area of the Cote de Beaute. Shower room, with hand basin. Separate toilet. Hairdryer provided. The living room has comfortable seating - sofa, 2 armchairs and coffee table. Mini hi-fi, selection of CDs, books and children's games. Open plan to living room. The fully equipped kitchen contains table and 4 chairs, fridge, grill, small oven, 2 gas hobs, microwave, toaster, iron and all kitchen utensils. Oils, herbs, salt and pepper provided. 18 hole golf course at St. Palais sur Mer. 9 hole golf course at La Palmyre. 18 hole golf course at Saintes. Notes on accommodation:STRICTLY NO SMOKING, NO VAPING,NO ELECTRONIC CIGARETTES. NO PETS ALLOWED. Hot water available 24/7. Heating by wall mounted convector heaters. Room fans provided. The accommodation is on 2 levels for a family of 4. Mezzanine is now enclosed, apart from stair access. The residence is perfect for a family holiday. Outside: The residence has secure pools, adult's and children's, open mid June - mid September,shared by the residents.There is a tennis court, boules pitches, and table tennis,rackets and bats provided. The house has a covered front terrace and garden, with table and chairs. Rear terrace with sun awning, loungers, table chairs, and BBQ, which is private and quiet, overlooking a wooded area. The situation of the house allows the choice of sunshine or shade at all times of the day. Beach mats, seats and sun umbrella are provided. The property has its own parking space,no 226,but you can park outside. Cleaning / Towels / Linen / Maid service: The house will be in a clean and tidy condition on your arrival, you agree to leave it the same on your departure.If not left clean,a min charge of £50 will be taken from your bond. Cleaning products are provided.BED LINEN,TOWELS & BEACH TOWELS ARE NOT PROVIDED. This is a lovely property, a home away from home, has everything you could need. We used the pool nearly every day, eating lunch alfresco on the patio, and a great variety of local restaurants. Christine and Keith provide a great guide for local amenities, which lead us to the Sunday morning market at Royan which was particularly good, fantastic fruit. I would recommend a stay at this villa whether you are looking to chill & relax or gerting out and about there is such a lot to see. Great place to stay near Meschers and the beaches 'sur Gironde'. The apartment was not huge, but plenty of space for 2 adults and 2 kids for a week. Well maintained, very clean and well stocked with kitchen basics and utensils, games and sports equipment. Bottle of wine & water a nice touch on arrival. The shared pool, tennis court, boules pitches and table tennis table were also very clean and well looked after. Not far to walk to the beach down a quiet lane. Our favourites were Meschers (pleasant little town), a bike ride to Talmont and roadside oysters on the way to La Tremblade. A good base from which to explore the area. A very well equipped home as described by the owners who are extremely friendly and helpful. We enjoyed the proximity to the beach which is safe and clean. On site we made full use of tennis and boules- necessary equipment provided. Meals were eaten front or back of the house according to the position of the sun. La Palmyre Zoo very busy but a great day out- go early, also the Cote Sauvage only about 30 min drive for bigger waves. Meschers a very pleasant town with a good market and plenty of bakers. Well located within walking distance of several beaches, and restaurants.We enjoyed visiting the local towns along the beautiful coast line especially Talmont and St Georges. The house itself was spotlessly clean and very well equipped ,situated on a peaceful residence with a clean pool and modern tennis court. We also used the boules courts. The owners provided plenty of information about the local area and recommendations of places to eat and visit and were friendly and helpful, we felt they really wanted us to have a good holiday and were happy for us to use their beach mats, beach chairs, parasol etc. We travelled with our 12 and 15 year old children. Very young children or old people may find the steep open staircase difficulty. The local area is very French with local markets daily . We have replaced the old staircase with one that is less steep, and closed in. Appartement très propre et bien équipé pour le quotidien. Un peu chaud dans les chambres à l'étages après de longues journées ensoleillées. Tennis et piscine dans la copropriété bien entretenus et accessibles. Wifi de la résidence vers la piscine mais pas dans l'appartement. Belle plage à proximité (10 min à pied). Our local beach, Plage Vergnes, (with its beachside bar and pizza restaurant), is an 8 min stroll along a quiet lane. Meschers has 5 sandy beaches to choose from, all within a 10 mins drive. All are cleaned daily and child friendly. A short drive away are the huge pine backed beaches of the Grande Cote and Cote Savage. The area is ideal for cyclists, with routes through pine forests and coastal areas.A variety of activities are available, e.g. canoeing, boating, golf, horse riding and surfing. Nearest airports - La Rochelle (approx 1 hour north), Bordeaux (approx 1.30 hour south). Use of a car is recommended to explore the area. Location map of the house will be sent on completion of booking. Meschers is approx 1km away, with its supermarket, bank, pharmacy, bakers and small shops, daily morning market, port area with restaurants, boat trips, cave dwellings, 10 pin bowling.Free wi-fi at Tourist Office. St. Georges de Didonne, with its lovely long beach,tree adventure park, attractive village square and daily morning market (in peak season) is 3kms. The resort of Royan (6kms) with its beach and marina, has a large selection of shops, restaurants, and a superb daily produce market. There are many interesting places for day trips. The ancient walled sea port of La Rochelle (approx 1 hour) is well worth a visit, as is the neighbouring Ile de Re (approx 1 hour), which is reached by toll bridge. Closer to Royan, the Ile D'Oleron has an interesting fort, and long sandy beaches. Bordeaux (1.30 hours) with its modern tram system, is a lovely city, with its historic centre and links to the wine trade. The Roman city of Saintes, 45 mins away, has a huge street market on 1st Monday of the month, Roman remains, ampitheatre and boat hire on the Charente river. At Cognac (1 hour), you can visit world famous distilleries, e.g. Hennesy, Martell, etc. From Royan, the ferry crosses to the Medoc, famous for its vineyards - a wine lovers paradise! La Palmyre Zoo (25 mins drive), the largest in France, is a good day out for adults and children alike,and is very popular. In July and August there are numerous free local events, e.g. firework displays,concerts, and dances. There are night markets selling local crafts. Regular boat trips along the coast give a different perspective to the unique fisherman's carolets, rugged cliffs, and fine beaches. The pretty village of Talmont (a 10 min drive) is well worth visiting, with its romanesque church on the headland, and cobbled streets full of hollyhocks. The Charente region is famous for melons, sunflowers, corn on the cob, restaurants renown for 'Fruit de Mer', and the aperitif Pineau des Charentes (cognac mixed with red or white wine). Free 'tasting' stops are found in every village. There is a large variety of fine restaurants in Royan and the surrounding area, and a 'must' to visit is La Foret, a 10 minute stroll from the house. You can forget about your car and enjoy the experience! An information pack in the house gives details of things to do, places to see, and restaurants to visit. Booking Notes: £200 deposit is required, and the remainder 8 weeks before booking date,or full payment if less than 8 weeks. £150 security bond is required, and will be returned in full at the end of your stay if all is well. NO PETS ALLOWED. THIS IS A STRICTLY NON SMOKING PROPERTY, INSIDE AND OUTSIDE- NO VAPING/ELECTRONIC CIGARETTES. There is no cleaning charge, but you are expected to leave the property in a clean and tidy condition. Cleaning products are provided. A security bond of £150 is required, and if the property is not left clean, there will be a minimum charge of £50 taken from your bond. The bond will be returned to you in full if all is well after your stay. No linen or a towels are provided. Please do not flush nappies or tampons down toilet. Use only bottled water in kettle. Please leave toilet roll and water for next guests, and please sign our visitors book. Changeover Day: Changeover day is Saturday. Arrival after 4pm, departure 10am. Notes on prices: Prices are for the property per week in UK Pounds.